If you're looking to escape city life — or just everyday life — look no further than Colorado campgrounds. 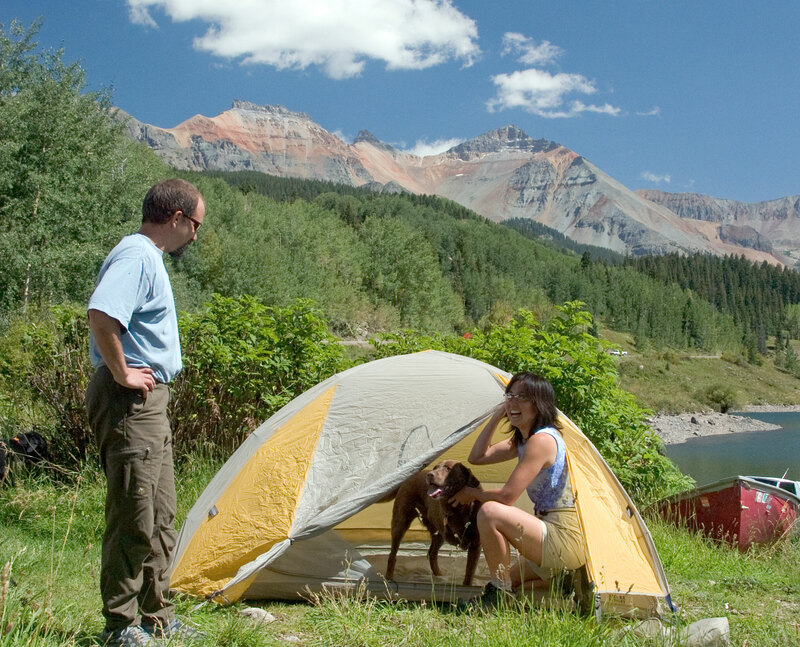 With terrain as varied as ours, it's important to pick your Colorado camping destination with both scenery and activities in mind. From the plains to the Western Slope, you're bound to find the camping spot you've been daydreaming about. Below is just a glimpse of what 11 campsites around the state have to offer. For other lodging ideas, consider a stay on a Colorado lake. One of the nation's most popular national parks, which celebrated its 100th anniversary in 2015, has a few options for campgrounds. We like Glacier Basin for its views of the Continental Divide and easy access to Estes Park's amenities and the shuttles that run through the park, making exploring the park a real cinch! This park is a one-stop recreation destination with excellent hiking and biking trails, birdwatching opportunities, ranger-led activities, beach volleyball and water sports. But its reputation for huge, hard-fighting rainbow trout and pike that draws anglers to its waters. The largest pike ever caught in Colorado was hooked here, weighing in at 31 pounds, 11 ounces. By camping standards, the KOA's sites sit in the lap of luxury: Think swimming pool, Wi-Fi, on-site bike rentals and one-room cabins with minifridges. If you can tear yourself away from the campground, explore the scenic views between the high desert of the Colorado National Monument and the shady lakes of Grand Mesa on one of the many ATV trails weaving through the area. As U.S. Hwy. 50 winds through the high-mountain desert, the view suddenly opens up into a broad landscape of sparkling blue water and talus-sloped hills. Here is where the crystalline waters of the Gunnison River gather before carving through the steep walls of the Black Canyon of the Gunnison. With 93 miles of shoreline, abundant recreation and lounge-worthy beaches. Tucked in a canyon within the park, this campground is known for its incredibly quiet, serene setting — with the advantage of being just half an hour's drive from the park's famous archeological sites. Hikers will also enjoy the options of leisurely and challenging trails. For a special moment, take the Knife Edge trail and gaze down upon the Montezuma Valley at sunset. Encompassing 150 miles of the rafting-bonanza that is the Arkansas River, this recreation area caters to whitewater lovers of all skill sets. When the rafting and kayaking day is done, try your luck at gold panning, which you can do just about anywhere along the banks of the river. Set amid rolling foothills just 15 miles from Denver, Chatfield Reservoir is the quickest way to get a boat on the water in the metro area. While relaxing on the beach or fishing in your boat out on the lake, keep a look out for the many model airplanes and hot air balloons up in the sky — or fly one of your own. Tailored to those traveling with horses, Jacks Gulch offers campsites with corrals and a nearby networks of trails amid aspen stands and ponderosa perfect for leisurely rides. The campground is also near Colorado's only nationally designated Wild and Scenic River, the Cache la Poudre, which is popular with fishers and whitewater worshipers. Get up close with nature with a canoe-ride around this glassy five-acre lake at the base of Mount Evans. Take a side trip up the highest paved road in the country — the Mount Evans Scenic Byway passes alongside other alpine lakes, massive granite walls, stands of twisted, ancient bristlecone pine and occasional scampering mountain goat or bighorn sheep. There's no better description for this park than an oasis amid Colorado's expansive eastern plains. Its warm, South Platte River-fed water and sandy bottom and beaches welcome swimmers and waterskiers looking to cool off each summer. It's also an ideal location to hunt for waterfowl, pheasant, upland birds and deer (archery). Search for dinosaur footprints in the largest assemblage of dinosaur trackways in North America, which you can hike alongside of — or even in — on segments of the Picketwire Canyon trail. You can also explore remnants of the Santa Fe Trail's mountain branch, the historic pathway that led pioneers to the then untamed Wild West.